You are a foodie. Your cooking methods have continuously and painstakingly insulted you while preparing your meals. And you're wondering why 2018 has not been your year (of breakthroughs). You donâ€™t have to be toiling several hours in the kitchen to avoid the atrocity that comes with unmanned meals. 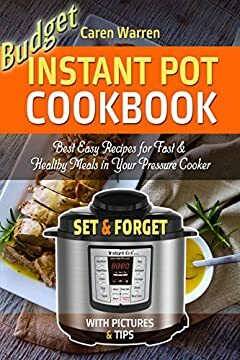 All you have to do is follow the recipes that are listed in this book: â€œBudget Instant Pot Cookbook: Electric Pressure Cooker Recipes Made Easy and Fast for Your Healthy Meals Plan (instant pot electric pressure cooker cookbook)â€ by Caren Warren. You will discover how you successfully put yourself in a box and threw away the keys. With that said, all is not lost and it will help you unlock all of the benefits that come with your pressure cooker. easy to prepare recipes, beautifully laid out with gorgeous photography â€“ making them a joy to create! the faster version for your favorite comfort meal. IP is pure goodness in your hands! Set it and Forget it.